We are offering Photo Keychains to our clients. Quick overview Unlock the door to the heart of your someone special with a wide range of personalized custom keychains, designer keychains, and name and photo keychains at Giftam. This Key Hanger has a wrought-iron look and feel, and measures approximately 8 x 8. There is a high quality ceramic tile that is placed in the center. There are 4 hooks to hold keys. It hangs easily on any wall, and would look great outside the main door, inside in the lobby, or even inside a room. We are an acclaimed name engaged in offering our precious clients a superior quality range of Sublimation Photo Keyrings. These key rings are widely used as promotion items in restaurants, shops and companies. Our given key rings are designed using top quality of material & modern techniques as per the trends of market. 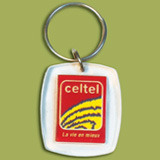 We provide a wide range of keychains in different material like Metal/ Plastic/ Acrylic/ pvc etc. 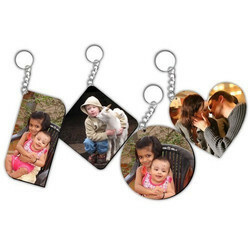 Attached here is an option of Metal Keychain with Photo Frame. Leveraging the skills of our qualified team of professionals, we are engaged in providing Acrylic Photo Frame Key Chain.